Our Grande Nueva is the classic JijiBag. It is an understated fashion accessory available in five luscious colors. Jijibags are handcrafted of 100% virgin merino wool felt. This felt is sustainable and manufactured in an environmentally friendly manner. Your Jijibag is easy to care for! Our felt material has been given a special distressing process which makes it dense and impermeable to rain and snow. It also makes our bags simple to care for. Cleaning can done with a light brushing. If necessary, you may submerge the bag and wash with a mild shampoo or similar product, and then air dry the bag. The Grande Nueva has two internal pockets in a contrasting dynamic red colored felt. 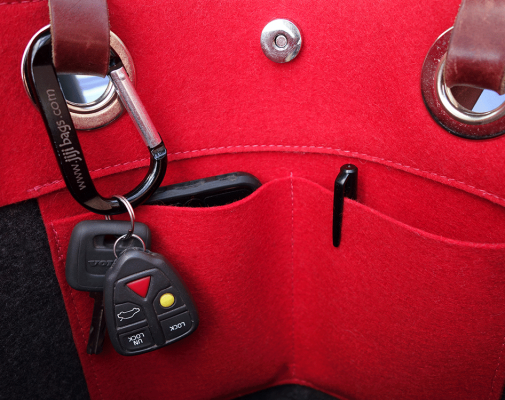 One side is stitched into two sections to make it easy to find your phone, lipstick and other smaller items. The other side pocket open for things that are a little larger - such as a notebook and phone charger. The main compartment will easily accommodate your laptop and other bigger objects. Our felt retains its rich color, shape, and strength for decades and really just gets better with age. The strap handles are made from supple harness leather and our quality hardware is brass with a zinc finish. The Grande Nueva has a magnetic snap closure to keep things safe. The bottom section is made of a thick double layer of felt to keep the bag rigid and strong. It measures 18" wide, 13" high, the base measures 5.5 x 11. The strap is 21 inches long, just right and comfortable for over the shoulder. Each bag is cut and sewn by a talented artisan here in Taos, New Mexico.